My son Ezekiel was nicknamed Pinocchio since birth by his Great Grandfather Agustin "aka" Geppetto. We custom made both outfits, without patterns. My mother-in-law made the Pinnocho costume from scratch and used a few Pinocchio movie pictures that I printed out. She used a pajama to get the sizing down. 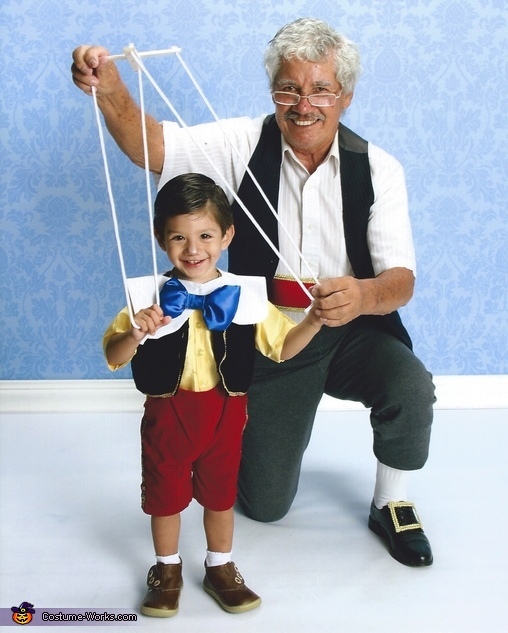 As for the Geppetto Costume, it was a group collaboration amongst family members as were the wooden puppeteer strings. The whole costume cost $100 to make but the memories captured in the pictures made it priceless. I LOVE IT!!! I SAY 1ST PLACE!!!!! VERY CREATIVE AND BEYOND ADORABLE!!! Love this costume duo! Super cute!